Homeowners put substantial money, time and effort into creating a friendly, stylish backyard for their families. A pool can be the key ingredient for the perfect backyard. However, a pool can become very uninviting once algae takes over. Algae is often a problem for backyard pool owners. With regular maintenance, chlorinating compounds stop algae blooms. However, when untreated, algae can cause minor damage to a pool and pool equipment as well as be a danger sign to swimmers and those who frequent the pool. 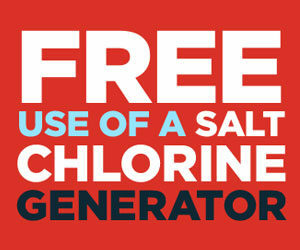 Pool Troopers wants to help you to learn more about this unwanted guest in your swimming pool. It is a single-celled chlorophyte that uses photosynthesis to make its own food. In fact, because it comes in many varieties, this tiny plant-like chlorophyte is adaptive to a host of conditions. Microscopic in its size, it takes many millions of this plant to exist before it is seen by the naked eye. Science has considered the green variety to be the earliest closest relative to the higher plants found in nature today. Some of the green types have been used as a source of nutritious food as well as nutritional supplements. They are also used in the treatment of wastewater and are being looked at for their potential for producing biofuel or fuel. However, this species while beneficial in some aspects is not wanted in a swimming pool. The reason is the algae itself becomes a breeding ground for bacteria. The green variety is the most common and invasive in residential swimming pools. You might first spot it as a small formation on a wall or floor of the pool. If unchecked, it can overtake the clear water and turn it into a slimy green mess. It then attracts bugs which come to feed on it, as it also becomes more attractive to frogs. As critters and creatures take it over, the pool is no longer suitable for those who built it to enjoy. The green mess is also home to the bacteria that live within the bloom. After a serious unchecked bloom, filters will need to be disassembled and cleaned or have parts replaced in order for the pool to be used for swimming again. Significant chemical expenses and time will be spent cleaning up an unchecked algae bloom. The best way to fix a bloom is to not allow one to occur with regular cleaning and chemical maintenance. Making sure a costly algae bloom stays out of the pool will help make it safer for swimmers. What are some of the swimming health hazards? Although this bloom itself can’t harm you, the bacteria that feed on it can cause many health concerns. Do not swim in a pool that has visible live algae. If it brushes off the walls and the chlorine reading is good the algae is dead in place and its ok to swim after cleaning and cleaning the filter. If it smears on the wall or floor when brushing the algae is alive and you should not swim until the chlorine has done its job. Check your chemicals, add a chlorinating compound and clean your filter. Wait to swim. The best way to avoid the damage of a bloom is to prevent it from happening in your swimming pool; it should be addressed before it causes issues to the pool or the health of the swimmers. The right chemicals can be added that prevent the formation of algae-growth and the bacteria associated with it. Pool Troopers can help you with testing and regular care of your pool to make it safe for family, friends and guests. We can discover the causes of cloudy or green water and fix it’s causes before the bloom takes hold of your pool. Green water can also be caused by pollen or metals in the water. However, the cause of the green color should be discovered through testing, which is part of our pool care program. We recommend you do not swim in green water. We can help with cleaning and microscopic algae and bacteria is exactly why at Pool Troopers we do not accept spot cleaning. We do all steps to that you ask for each time we visit. Our full cleaning of concrete pools includes a full brush and vacuum service according to schedule. Packages are designed to meet your budget and keep your pool clean and worry-free when it comes to the growth of bacteria and algae. 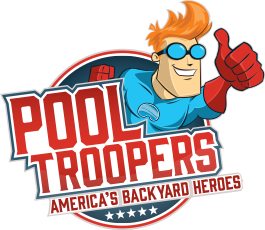 With professional and worry-free service from Pool Troopers, you can avoid costly mistakes and misdiagnosis of problems. Trips to the pool supply and storage and handling of chemicals are avoided. You will no longer need to store chemicals where they can be reached by children or pets. Saving you money as well as time is our job, so you can do yours. Our Net Zero approach is designed to help you maintain a safe and healthy pool with our premium chemical service. Give us a call at 1-866-766-5877 to make an appointment to assess your water concerns, especially if the water is cloudy or green. 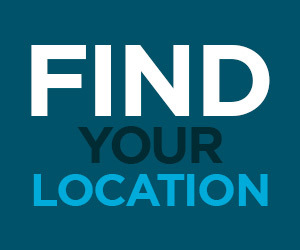 Our professionals can diagnose as well as take care of the problem, providing you the freedom to enjoy your pool by making it swim-friendly to guests and family.